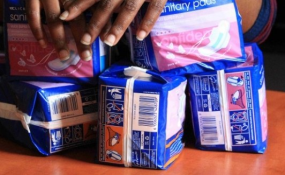 May girls routinely skip up to a week of school every month because they don't have sanitary pads (file photo). Disadvantaged girls in various schools, recently received sanitary pads from FNB North Cluster, who also handed over refuse bins to various northern towns this week. Abongile Npikwa, Far North Sales and Services Manager emphasised the dire need for sanitary pads in the community, stating that they know that girls stay home from school because of a lack of sanitary pads, and this is counter-productive to a great learning experience. "It means that they miss school for around of 10 weeks of the year, therefore we hope that our donation will make a difference and ensure they can attend school and enjoy their educational journey," she added. With the donation of the refuse bins in Oniipa, Okahao and Rundu Town Councils Nipwa said they aim to create a better environment around them, and as a business they believe it is also their duty to look after the area they actively operate in. "We wish to encourage people in the community to recycle to reduce the burden on landfills, while creating a healthier and more sustainable environment," she concluded.